These easy-to-make mini sweet corn casseroles are made with simple ingredients and a drizzle of honey on top for a sweet caramelized glaze. Preheat oven to 350 degrees F. Spray 8 ramekins with cooking spray. Place them on baking dish for easy baking. Set aside. Drizzle a bit of honey on top of each ramekins. Bake for 45-55 minutes, or until golden brown. Serve immediately and enjoy! 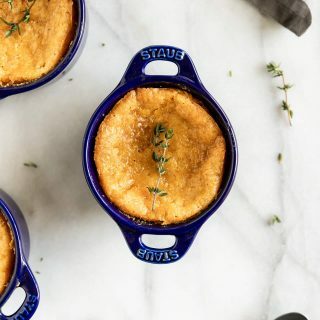 *Depending on the size of the ramekin, you can fill 6-8 ramekins with this recipe. I used mini Staub cocottes which are 8 ounces each (0.25 qt) and was able to fill 6 of them with this recipe. You can use a baking dish instead just keep an eye on it. Insert a toothpick to make sure it is cooked all the way through before removing it from the oven. You can make this recipe the day before and warm it up before serving.